Sports agent Chauntiel Smith’s momma, Yvette, has kept her daughter’s career and life paths on time for appointments. In high school, the motherly prompting was for sports. Today, Yvette pushes and prods her daughter as she magnifies her business, Capture Sports Agency (CSA). “You need to be here at this point. You need to figure out how you’re going to make money this way,” Smith, 25, said, paraphrasing Yvette. “It’s a good thing because I need it.” It was at South Side High School when Smith realized that she maybe wanted to be a sports agent. Smith was all about sports at South Side. 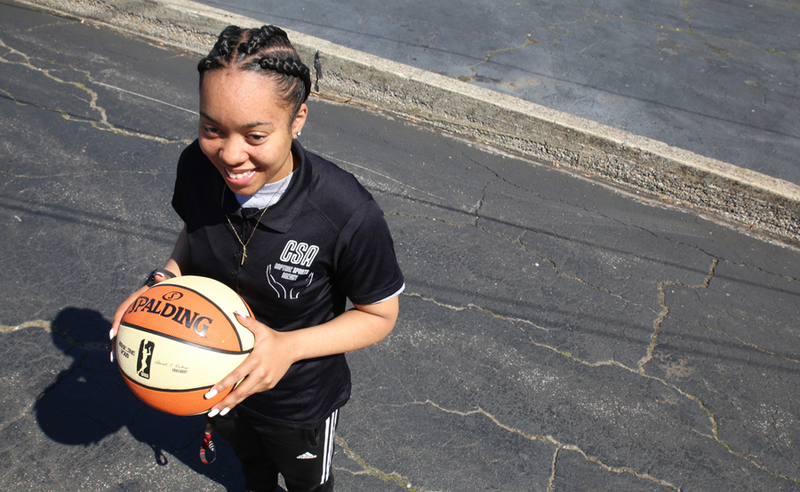 She ran track and wanted to parlay her basketball into a WNBA career. “That didn’t happen,” said Smith, who didn’t receive enough playing time to get good looks from colleges. It was at Indiana Tech when Smith realized that she most definitely wanted to be a sports agent. She started CSA in 2015 and found clients without her eventual bachelor’s degree in Business Administration with a concentration in Sports Management. Smith hustled, but doesn’t brag; she lists, when she is asked about her resume. CSA represents four male basketball players (pro-am who could be playing overseas if they’re signed) and two male track and field athletes from Indy (who run professionally). She has seven interns nationally, who scout, recruit, and specialize in media and player relations. One intern, Jason, is here for the summer. She is certified for the WNBA, the International Basketball Federation (FIBA), and the WKBL for all of Korea “which is like the second-ranked league pay wise behind the WNBA,” Smith said. For certification, an agent has to take a test and pay a registration fee. However, depending on one’s experience, an agent you can test out. “I decided to do the WNBA [certification] first because it was the cheapest.” Smith didn’t have to take a test for the WNBA because of her internship in Dallas while at Indiana Tech. The internship was for such a reputable company that the WNBA waived the test portion for Smith. The WNBA certification prompted FIBA to waive its test portion for the Fort Wayne native. And the FIBA certification followed suit. “I’ve said this before, but I wanted to be the next Eugene Parker or better,” Smith said, but she could never make a connection with the late great sports agent and Fort Wayne native, who represented the NFL’s Ray Russell and Deion Sanders. She has over 16,000+ connections. If you’re in a professional league, or are any kind of professional, Smith approached you through LinkedIn. Since high school, she “always liked talking to people,” Smith said. Smith developed her business philosophy after all that online and offline networking. For her clients, she wants that personal connection. She directs them to front their camps, develop foundations, and building a brand based on community involvement.